Decorated or printed glass and china have been appreciated for their beauty, form and longevity over thousands of years. From industry awards through to sporting trophies in Melbourne, our skilled and artistic engravers can give you the perfect memento for a special or notable occasion. Egyptians honoured kings and sent their masters to the next life with coloured glassware, such was the perceived value. The Chinese developed the firing of clay in kilns to produce porcelain. Practical everyday items were created as well as outstanding pieces of art that endure today. Over the centuries glass and china have been presented to visiting dignitaries as gifts of appreciation and friendship. Today we continue this tradition by creating custom decorated glass and china, commemorating important occasions. Throughout our 70 years of operation we have specialised in creating unique decorated glass trophies, printed mugs and mementos for sporting clubs, family reunions, anniversaries, weddings, special events, schools and many businesses. The perfect option for bowling trophies, golf trophies, netball trophies, cricket trophies and basketball trophies, Melbourne’s C.R. 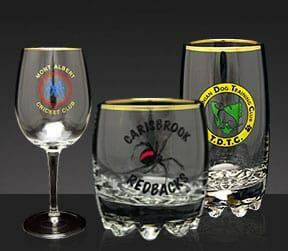 Hose Glassware can craft sporting club trophies emblazoned with team colours and engravings. A C.R. Hose Glassware custom glass trophy is the perfect way to acknowledge and commemorate the achievements of your sporting club. We pride ourselves in preserving traditional glass decorating techniques, bringing them into the modern age through our high-quality commemorative glassware and sporting trophies for Melbourne and across Australia. Our expertise in the application of precious metals and enamels to china and glassware is well recognised for outstanding quality. If you are planning an event or involved in a club, you will find what you are looking for on our site. Make your special day extra special by trusting the passionate and precise team at C.R. Hose Glassware. Express your gratitude to your guests who have travelled to witness your nuptials by having an engraved wine flute as a gift. With a number of unique, stylish, and timeless options available you can ensure that your guests fondly remember your wedding ceremony and their part in it for decades to come. Click here to learn more about our exceptional engraving and custom-made trophies.